The EU needs to establish a Town Centre Taskforce for Northern Ireland-that was one of the key points in theEU Five Point Plan launched today by the Northern Ireland Independent Retail Trade Association (NIIRTA). Local European Parliament candidates Jim Nicholson, Anna Lo, Alex Attwood, Diane Dodds, Tina McKenzie and Ross Brown attended the launch in Ballyhackamore. “We strongly welcome Peace IV funding, but for it to be much more focused on supporting local economic development projects in areas that suffered from the conflict”. 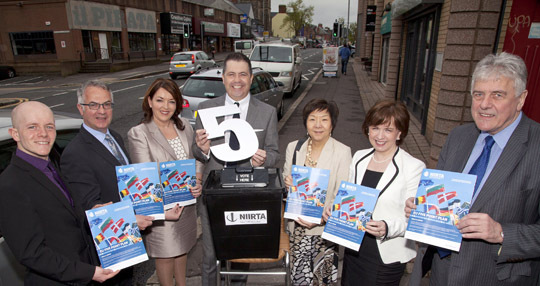 Ross Brown (Green Party), Alex Attwood (SDLP), Tina McKenzie (NI21) Glyn Roberts (NIIRTA CEO), Anna Lo (Alliance), Diane Dodds (DUP) and Jim Nicholson (UUP) launching the NIIRTA 5 Point Plan for Europe in Ballyhackamore.